Like all great wines, Richard Perry's story starts with the soil. In 1988, Richard & Sheila Perry planted the first block of what would eventually become 15 acres of hillside vineyards on their ranch in Coombsville, the south-eastern corner of the Napa Valley. The Perry Vineyards were a work of pure passion combined with an unstoppable work ethic. Richard personally carved the terraces out of the panoramic hillsides of their estate. They planted Cabernet Sauvignon, Syrah, and a bit of Merlot and began selling their fruit to Napa wine makers. Richard was one of a handful of growers in those days who had begun to realize the full potential of the soils and of the climates in Coombsville. In an effort to showcase the superior qualities of his fruit and of his vineyard's terroir, Richard decided to produce his own wines under the Richard Perry label. Their first commercial vintage was 1997. Ever curious and always looking for improvement, Richard teamed up with another Coombsville pioneer, Ken Bernards, bringing him on board as his wine maker starting with the 1998 vintage. Together, the two of them honed the viticulture and the wine making towards the beautiful expression of Coombsville terroir for which the Richard Perry wines are now well-known. Richard was not your average dreamer--for him, dreaming led directly into doing. His passion leading the way, he carved out his vineyards and built up his brand with hard work, insatiable curiosity, and an unrelenting demand for only the highest quality. We lost Richard to a tragic accident in 2007. Moving forward after the loss of a loved one is never easy, never simple, and the pathway is rarely direct. Richard was a man who poured himself into life, and he left a huge impression on everyone he met, everyone he worked with, and everyone he loved. 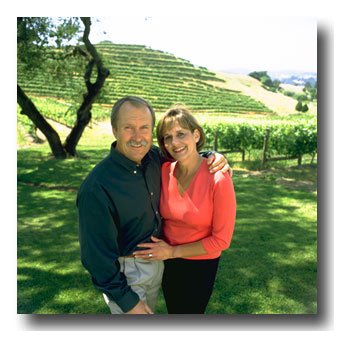 Wanting to protect his legacy and to pay proper homage to Richard, Sheila Perry invited Ken Bernards to become her business partner so that together they could develop and protect the future of Richard Perry Wines. Today, it is our privilege to celebrate Richard's legacy by insuring that each and every bottle of Richard Perry Wines meets the high standards of quality that Richard set, the depth of personality that he sought in his wines, and that whether it is opened now, or cellared for years, that its balance, its aromas, its flavors, and its finish serve well to toast a man well-loved and a life welllived. Join us in toasting to Richard Perry.